Kennedy Space Center - Universe Galaxies And Stars Section. 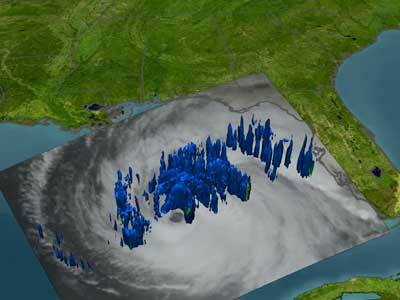 NASA's Kennedy Space Center Could Be Damaged by Ivan. Although Hurricane Ivan spared NASA's Kennedy Space Center, several of the agencies other facilities weren't so lucky. The Stennis Space Center in Mississippi and the Michoud Assembly Facility in New Orleans were much closer to the point where the enormous storm came ashore on the US Gulf Coast. Stennis is where the space shuttle's engines are tested, so they were secured for the storm; one was returned to its container, another was wrapped in plastic, and two development engines were secured on their test stands. Michoud is where the shuttle's external fuel tanks are manufactured and assembled; these were secured, and assembly equipment was moved inside. NASA will get an idea of the damage later today or tomorrow, when its employees begin returning to work. NASA's Stennis Space Center in Mississippi and the Michoud Assembly Facility in New Orleans are riding out Hurricane Ivan, which made landfall near Gulf Shores, Alabama, overnight. NASA has made preparations to secure important space flight hardware against damage. Stennis, where Space Shuttle engines are tested before flight, is about 45 miles inland near the Mississippi-Louisiana border and is home to about 300 NASA personnel and 1,250 NASA contractors as well as employees from other agencies. Workers there were sent home Tuesday, Sept. 14 to prepare for the storm, and the center is not expected to open before Friday, Sept. 17. Information for Stennis employees will be posted on http://www.nasa.gov/stennis as it becomes available. A team of about 50 essential personnel will ride out the storm at Stennis. Two flight-qualified Space Shuttle Main Engines at Stennis have been secured; one was put back into its container, and the other was wrapped in plastic. Two developmental engines were enclosed on their test stands and protected. A ride-out team will also remain in place through the storm at Michoud, across the Mississippi-Louisiana border about 40 miles to the southwest of Stennis. The NASA facility, operated by Lockheed-Martin, manufactures and assembles the large Space Shuttle external fuel tanks, and is home to about 3,900 employees from NASA, Lockheed-Martin and other agencies. Lockheed Martin and NASA workers were dismissed Tuesday, Sept. 14. to make preparations at home, and the facility is not expected to open before Friday, Sept. 17. Contact information for Michoud employees is available at http://www.nasa.gov/marshall. The shuttle fuel tanks at Michoud have been secured. Equipment has been moved indoors, facilities have been sandbagged, and important materials - such as insulating foam and adhesive - have been loaded onto trucks to be transported out of the area, if necessary. Meanwhile, approximately 14,000 people returned to work at NASA's Kennedy Space Center (KSC) this week, following an 11-day closure due to Hurricane Frances. Recovery efforts are already underway. The Vehicle Assembly Building (VAB), the Thermal Protection System Facility (TPSF) and the Processing Control Center (PCC) received significant damage. The Operations and Checkout Building, Vertical Processing Facility, Hangar AE, Hangar S, and Hangar AF Small Parts Facility received substantial damage.